With its peaceful foliage in the Rainforest Pyramid and beautiful marine life in the Aquarium Pyramid, Moody Gardens is a great place to spend this Valentine’s Day with your sweetheart or family. While you are at Moody Gardens, you can participate in the Sweetheart Scavenger Hunt. 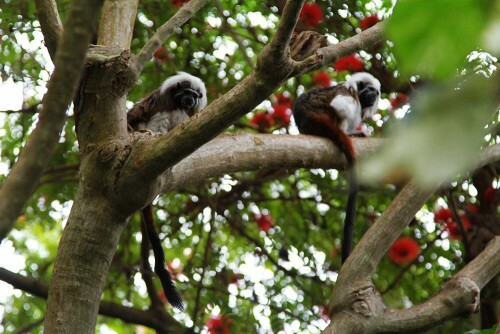 Learn about the intricate relationships and courtships that take place in the animal kingdom with this scavenger hunt. And best of all, you could earn a family 4-pack of Moody Gardens tickets by participating. Humans aren’t the only ones that give presents when they are wooing a lady. 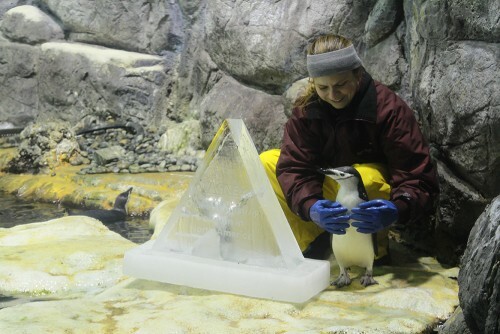 Male penguins give their potential love interests a pebble. They search for the smoothest rock, and if the female accepts, she puts it in her nest and parenthood soon follows. Some women wish men would experience the ups and downs of pregnancy. In the seahorse kingdom that’s exactly what happens, as the male delivers the babies. Scientists aren’t 100 percent sure why it occurs – maybe it is to help make more babies or just share some of the load from females – but it certainly is one of the most unique relationships under the sea. A scarlet ibis believes in true love. When a male successful woes a female, they will remain partners for life. 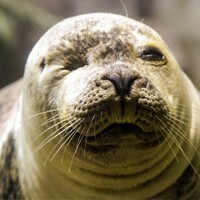 Harbor seals flirt by rolling and bubble-blowing. 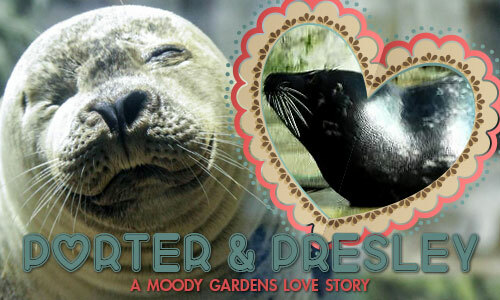 You can read about our Moody Gardens harbor seal couple, Porter and Presley, here. Learn about these and the other animals at Moody Gardens when you visit on Valentine’s Day weekend. 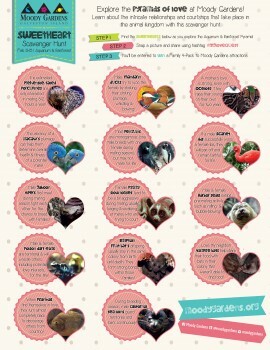 Be sure to download the Sweetheart Scavenger Hunt and get your cameras ready to win a great prize! And don’t forget to dive into a romantic underwater dining experience at the Aquarium Pyramid with the Sea of Love Valentine’s Dinner on Feb. 13 or 14. Enjoy a special menu created exclusively for the Sea of Love Dinner. You can reserve a table with a view of one of the unique locations throughout the Aquarium Pyramid. Dinner for two is $140 on Friday and $180 on Saturday. It also includes rose for her, souvenir photo and Aquarium Pyramid admission. Saturday’s dinner also includes a bottle of wine or champagne. Biologists will also be in attendance to answer any questions you may have about the spectacular residents of the Aquarium Pyramid. To reserve your spot, please call 1-800-582-4673 ext. 4368. Reservations are on a first-come, first-serve basis. Calls will be answered and returned daily. RSVP by February 11. Click here for menus. Posted on February 9, 2015 Author Moody GardensCategories Animals, Aquarium Pyramid, Conservation, Events, General, Rainforest PyramidTags Animals, Aquarium, Galveston, Harbor Seal, macaws, Moody Gardens, Ocelot, Penguins, Porcupine, Rainforest, Scarlet Ibis, Scavenger Hunt, sea lion, Seal, Valentine's Day, ZooLeave a comment on MG Sweetheart Scavenger Hunt! 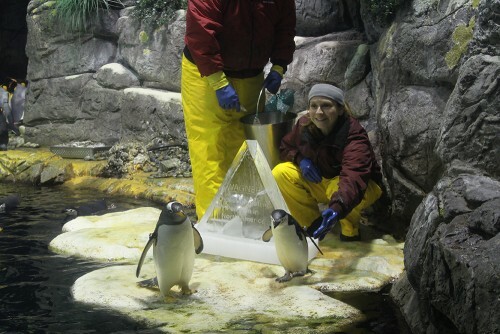 One of the Moody Gardens Aquarium Pyramid’s most famous couples is Porter and Presley. 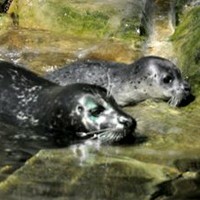 These harbor seals met in 2006 and immediately became inseparable. 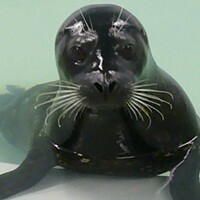 Porter, who was rescued as a pup off the coast of Maine after being abandoned by his mother, made his home at Moody Gardens in 2001. He had excellent care by the staff at Marine Animal Lifeline Rehabilitation Center, where unfortunately an infection caused him to lose his eye. Porter would not hunt the live fish that he was offered, and biologists decided Porter would not be able to survive in the wild. Since he was unable to be released, a search for a new home for him began and Moody Gardens created a home for him at the Aquarium Pyramid. Five years later, Presley joined the Moody Gardens family. After her companion at the Memphis Zoo passed away, caretakers knew the young harbor seal needed a companion. Even though Porter had fur seals and sea lions in his North Pacific Exhibit, the addition of Presley provided better companionship. Two habor seals together provided a more natural situation and made future breeding an option. In 2011, Porter and Presley had a pup named Riley, after the former President of Moody Gardens Mike Riley. The couple had conceived in the past, but that was their first successful birth. The newborn seal and first-time mother Presley spent their time together bonding through activities like nursing and exploring their exhibit. Riley has since moved to the Gladys Porter Zoo in Brownsville, where she has two young males to hang out with and possibly have pups of her own. You can visit Presley and Porter at the Sea of Love Valentine’s Day dinner on Feb. 13 and 14. This romantic dinner includes a three-course meal, rose for her, souvenir photo and Aquarium Pyramid admission. The Feb. 14 dinner also includes a bottle of wine or champagne. To reserve your spot, please call 1-800-582-4673 ext. 4368. Reservations are on a first-come, first-serve basis. Calls will be answered and returned daily between 3-4 p.m. RSVP by February 11, 2015. That’s the best word to describe the voting results for the Moody Madness Elite Eight. Both top seeds, the Saki Monkey and the King Penguin, saw their chances of being named Moody Gardens’ favorite animal end in shocking results. The loss was especially tough for the King Penguin, which was defeated by just three votes. So we are down to the Final Four. Who will be the champion of the Rainforest and Aquarium Pyramids? That’s for you to determine! From brightly colored macaws to lounging lizards, more than 200 animal species have made a home in the Rainforest Pyramid at Moody Gardens. And as of yesterday, Moody Gardens has the second prehensile tailed porcupine born onsite since the Rainforest Pyramid’s grand re-opening. The reddish orange baby was born on the same exact date as its older sibling last year. A quill was sent for DNA testing to determine the gender and after, a name will be chosen. Weighing at 480 grams, the newborn is on exhibit inside the nocturnal gallery of the Rainforest Pyramid. Here is the mother, Bobby-Sue! Although the newborn looks as soft as a puppy, the quills will harden within a few weeks. Sharing an exhibit with the mother, Bobby-Sue, the new baby is climbing the trees and exploring the area. Bobby-Sue and the father, Bono, have been together since 2007 and this is their second baby since their introduction into the newly enhanced pyramid. 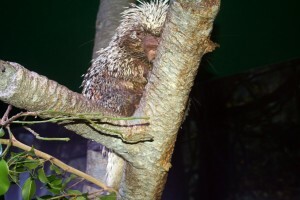 Prehensile Tailed porcupines are found in the wild in Central and South America. These vegetarian, tree-dwelling rodents usually weigh between four and eleven pounds and their tails are almost as long as their whole body. They are covered in short, thick spines and their body color runs from yellowish to orange to brown. One of their defining characteristics is a small head with a round, bulbous nose which is covered by short and fine hair. 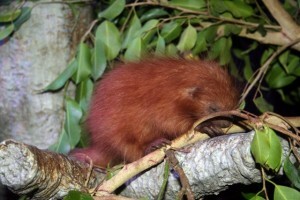 They also have whiskers on the face and feet that help in maneuvering around at night.This species is named for their unique tail, which is used a fifth hand to help hold onto branches as they climb throughout the canopy. The last 1/3 of the tail is spineless, enabling the animal to get a better grip on the tree branches. The front and hind feet are modified for grasping, which makes them excellent climbers. One thing they cannot do however is jump.Porcupines have a built-in defense. While most of their body is covered in sharp quills, they are incapable of throwing them, which is a common misconception. These quills will detach easily when touched and imbed into the skin of an enemy. They have also been known to hit and bite their attackers and curl up into a ball when caught. When provoked, they will stomp their hind feet, sit on their haunches, shake their quills and emit deep growls and high pitched cries. These defenses are so formidable that Prehensile Tailed porcupines have the luxury of a longer lifespan and slower reproductive rate than most rodents. Bat Facts: What’s with the hanging? Q: WHY DO BATS HANG UPSIDE DOWN? A: Unlike the bodies of other animals, a bat’s body is best adapted for hanging upside down. Its hind limbs have rotated 180 degrees so that its knees face backwards. This rotation aids in the bat’s ability to navigate in flight and to hang by its feet. Bats actually have specialized tendons that hold their toes in place so that they are able to cling to their roosts without expending any energy. In fact, bats must flex their muscles in order to let go of the roosting surface. These adaptations are quite helpful for a flying mammal since bats only need to let go of the roost in order to drop into flight. Hanging upside down also provides bats with roosting space away from predators in safe places on the ceilings of caves, in trees, and buildings that few other animals can use because they have not evolved to hang upside down by their feet. 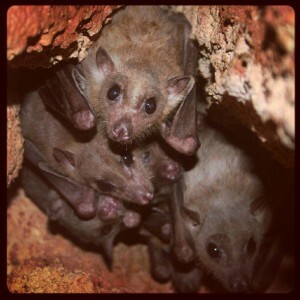 Visit Bat Conservation International to learn more about bats! Posted on May 11, 2012 May 11, 2012 Author Moody GardensCategories Conservation, Rainforest PyramidTags 2012, Animals, bats, conservation, Rainforest, Year of the BatLeave a comment on Bat Facts: What’s with the hanging? 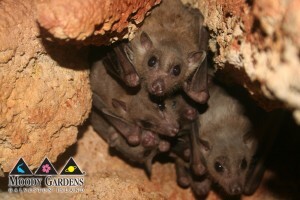 Throughout 2012 Moody Gardens® will bring attention to an often overlooked, but important animal: the bat. The United Nations has declared 2012 as International Year of the Bat and Bat Conservation International (BCI) as an International Year of the Bat founding partner. 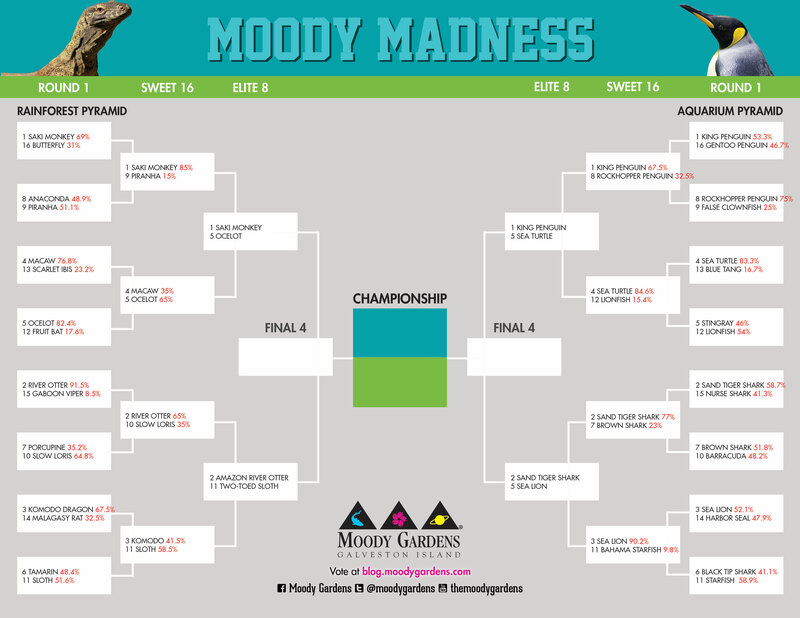 Moody Gardens® will be participating throughout 2012 with opportunities for the public to get involved in the conservation mission. The International Year of the Bat campaign aims to raise global awareness about bats, bat conservation and the unique roles bats play in our environment. The “Bat’s Are Doin’ It” fundraiser will bring attention to the ecological importance of bats such as eating their weight in harmful insects and pollinating many economically valuable crops including bananas and mangoes. Guests will leave with a new appreciation for this misunderstood animal species; which will assist BCI in their efforts to protect bats. Enjoy a special evening celebrating the mysterious creatures with a tasty bat- themed food and drink menu. The night will include a cocktail party, special guest speaker James Eggers from Bat Conservation International and a tour of the Rainforest Pyramid®. This event will give you the chance to help save an often overlooked animal species while celebrating the special holiday. • When: February 11th from 7:00 p.m. – 10:00 p.m.
• Included in the price: Heavy hors’ doeuvres and 2 drink tickets for specialty bat- themed drinks. Each attendee also receives a free “Bats Are Doin’ It” goody bag. • Other Information: Raffle tickets can be purchased upon arrival to the event. Prices are $5 for 1 ticket or $10 for 3 tickets.Prizes will include various fabulous bat themed packages. Proceeds raised for the event will be donated to the organization Bat Conservation International. This event is open to individuals who are 21 and above only.